RAWNCHY is a pioneering food brand that creates a range of delicious handmade raw-vegan desserts. Our philosophy is to provide all-natural tasty treats that are not only good for you but taste absolutely bangin'! All of RAWNCHY's products are dairy-free, gluten-free, soy-free, refined sugar-free, plant based and organic where possible, to give you nourishing, simple, good food. All of RAWNCHY's packaging is recycled, recyclable or biodegradable. Please dispose of RAWNCHY packaging responsibly. 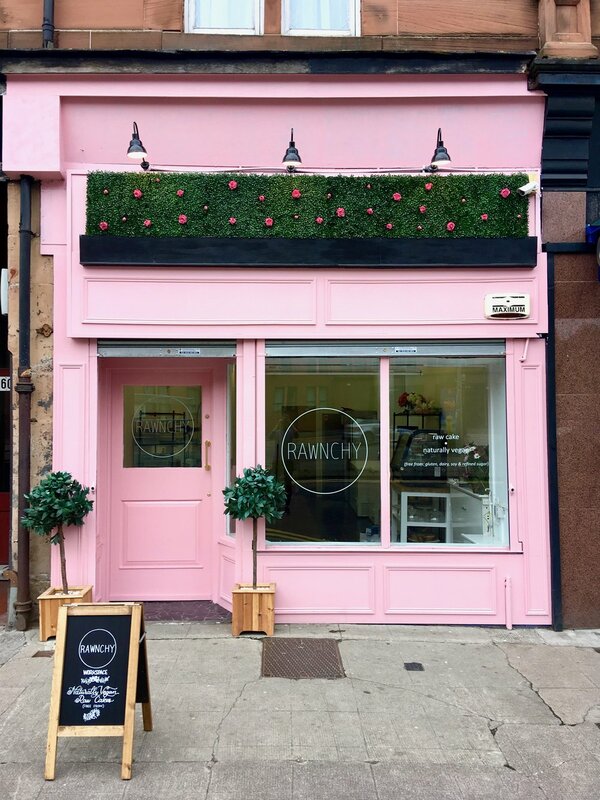 Rawnchy is a small independent company which was established in Glasgow by Poppy Murricane in June 2016. Poppy had been travelling and working in Europe and South East Asia for almost 8 years, latterly as a scuba diving instructor, when she came full circle and arrived back in Scotland again in January of 2016. Having been independent and a bit of a free spirit for so long, Poppy felt the urge to do something different, something that would allow her creative juices to flow whilst at the same time give her the opportunity to draw upon her own eating experiences gained during her travels abroad. Coming from a family where cooking plays an important role Poppy knew she wanted to do something involving food. She felt more and more drawn towards the idea of incorporating her love of healthy lifestyle and her interest of being eco-friendly into creating her own food product and brand. For months she toyed with different ideas ranging from starting a raw vegan café to becoming an edible flower farmer, all the while making and experimenting with her own raw vegan cakes for friends and family. Soon she was getting requests from not just friends, but friends of friends with various allergies, food intolerances and people who simply enjoyed beautiful cakes! Poppy began to get a very clear vision of the career path she wanted to follow. It had to be something she felt passionate about, was interested in and believed in. It had to be a product that she had created and developed herself and it had to be a way that she could help others to enjoy a delicious and healthy food experience. And that is how the story of Rawnchy began. Six months after her return Poppy wanted to test her product and luckily was offered the opportunity to showcase Rawnchy at the renowned “Let’s Eat Glasgow” Food Festival held annually at Finnieston’s SWG3. At breakneck speed she registered her business, bought equipment, designed the Rawnchy brand and was ready just in time to present at the forthcoming show. With the help of her mum and sister she took her place nervously behind the stall, steeling herself for failure. To Poppy’s surprise, and her family’s amazement, a queue quickly formed and then gathered momentum until she hurriedly had to phone a couple of stalwart friends to race over with more Rawnchy reinforcements to meet the burgeoning demands of the day! Poppy is a real people person and her warm personality and winning smile would convince even the most cynical and hardened carnivore to sample her wares. Even her dad eventually succumbed and tried one of her energy bites which he later admitted he had rather enjoyed! Rawnchy now specialises in both wholesale and celebration cakes. We sell all over Scotland with the number of followers on Instagram, Facebook and Twitter increasing daily. The website and online shop were launched on the 1st December 2017. Poppy's most recent achievement is the opening of her very own Rawnchy coffee and cake shop. Come and say hi! We are based Maryhill Road right next to St George's Cross subway station. The shop is bright pink- you can't miss it! “Give it a try,” whispered the heart.